Tari is one of the main festive items and is usually eaten on important occassions and festivals. Cardamom Powder – 1/2 tsp. Almonds (chopped) – 5-6 nos. Pistachio (Unsalted – chopped) – 5-6 nos. 1.) In a pan, boil the rice using the draining method (Do not add salt). Boil till the rice is completely cooked. 2.) Drain out the excess water when the rice is cooked and put the rice into thick bottomed pan and keep it on a slow flame. 3.) Add sugar and mix it well with the back of the spoon so that the rice doesn’t break. Let it simmer on slow flame till the sugar caramelises and is absorbed by the rice. 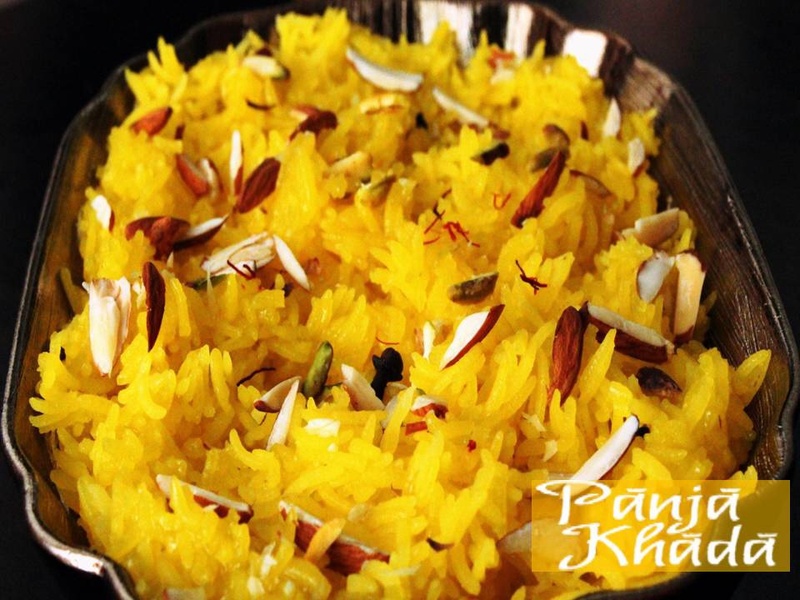 Add saffron and cardamom powder, mix it well till the rice starts turning golden yellow in colour. Cover the pan and let it simmer. Add melted ghee and few chopped pistachio and chopped almonds to the rice. Mix it well. Do not add water at all. 4.) When the sugar is dissolved and rice starts sticking to the bottom of the pan, then keep the pan on the tava and place it on a low flame for 3-4 minutes. 5.) Add melted ghee to Tari a few minutes before service. 6.) Serve piping hot garnished with the remaining chopped pistachio & almond. My mum puts elichi jo bhooko on top with the almonds and pistacios and it tastes yummy.